A powered parachute with its wing stowed. 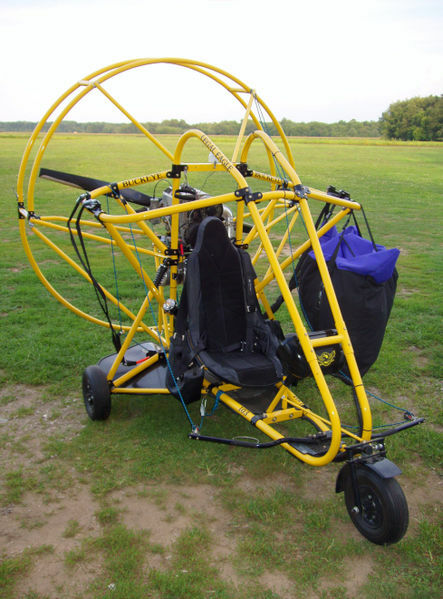 A powered parachute (motorized parachute, PPC, paraplane) is a parachute with motor and wheels. The aircraft's airspeed is typically about 25–35 mph (40–60 km/h). PPCs operate safely at heights ranging from a few feet off the ground (while ground skimming, a popular use of the aircraft) to altitudes as high as 18,000+ feet (5.5 km). But typical operating heights are between 500 and 1500 feet (150–500 meters). Equipped with the standard 5 or 10 gallon fuel tank, PPCs can typically be flown for about three hours. They have very short take-off and landing rolls, sometimes less than 100 ft (30 m). PPCs are among the least expensive aerial vehicles. A new one-person powered parachute may cost as little as $5,000, though single seaters more typically cost about $10,000. Top end two seater PPCs usually cost $15,000–25,000. Empty weight is typically around 200–300 lb (90–135 kg) and payload can be upwards of 500 lb (225 kg). In the United States, most single place PPCs are flown under part 103 of the Federal Aviation Regulations and, therefore, may be flown without a license or flight instruction. Flight instruction is, however, highly recommended, and an average student can learn to fly a PPC safely with 5 to 10 hours of flight instruction. Two-place PPCs are light sport aircraft in the United States. The pilot must have at least a sport pilot certificate issued by the FAA to fly them. A minimum of 15 hours of flight instruction, and 5 hours of solo as a student pilot is required to obtain this certificate. 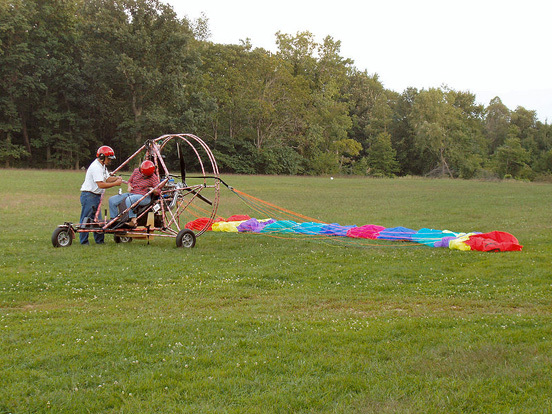 A powered parachute with its wing laid out in preparation for takeoff. PPCs are considered by many to be safer than normal fixed-wing aircraft because of their inherent stability, limited response to control inputs, and stall resistance. There are two primary means to control a PPC: increasing or decreasing engine power (which controls vertical rate of climb) and deflecting the right or left trailing edge of the parachute—typically by moving the steering bars with the feet—which turns the aircraft right or left). If the trailing edge of the wing is pulled in on both sides at the same time, the aircraft "flares," i.e., slows and temporarily gains additional lift. The flare is generally used to make fine adjustments in altitude when flying close to the ground and, in particular, when landing. The power-off glide ratio of a powered parachute ranges from 3:1 to 6:1. Glide ratio varies depending on the chute size and shape, and the weight that the chute is carrying. Engine-off landings are generally safe, provided that the aircraft is within glide range of a suitable landing zone. Although possible, it is difficult to cause the aircraft to get into a dangerous attitude, stall, or chute collapse by means of pilot control inputs. Chute collapse is considered by many pilots to be virtually impossible with Square "Wings." The wing is more likely to collapse with the more maneuverable but less inherently stable Elliptical Wing, but such collapses are normally followed by an immediate reflation and often go unnoticed by the pilot. In these rare circumstances where an elliptical wing collapses, the collapse is caused either by some extreme adverse meteorological condition or by pilot error. (The Federal Aviation Administration reports that over 80 percent of all aviation accidents are due to pilot error.) Inflatable Ram-Air elliptical wings can have upward of 30 individual cells whereas square wings typically have fewer than 13 cells. The main hazards one faces while flying a powered parachute are associated with wind and obstacles. Flight should not be attempted in winds exceeding 10–15 mph or in gusty conditions. Wind hazards include terrain-induced air disturbances called rotors (it is advisable to stay upwind of trees, mountains, and other obstacles that disturb the flow of the wind). Wake turbulence created by the passage of other aircraft, especially aircraft that are heavy, aerodynamically clean, and slow pose another significant hazard. And since the slow-moving powered parachute (like the helicopter) is particularly well equipped to fly safely near the ground, special care must be taken to avoid power lines, trees, and other low-level terrain obstacles. Forced landings in water are extremely dangerous, for pilot and/or passenger may become entangled in the parachute lines of a sinking powered parachute. PPC pilots typically enjoy flying "low and slow," and the PPC is an excellent platform for sightseeing and photography. PPCs are also used in agriculture, and occasionally by law enforcement agenices and flight search organizations such as ELLASS (Emergency Low Level Aerial Search and Surveillance), a search and rescue organization founded by the PowerChute Education Foundation. PPCs do not need an airport to take off and land. Many pilots fly from back yard strips, small airports, and mown hay fields. In the U.S., ultralight PPCs (like other classes of ultralight aircraft) are not allowed to fly at night. See FAR part 103 for regulations governing U.S. ultralights. However the FAA implemented in 2004 the Sport Pilot rule which expanded the range of venues in which PPCs can legally fly. Indeed, a properly equipped PPC may be flown at night or over metropolitan areas by a private pilot with a PPC rating. Very simple versions that consist of a backpack-mounted motor with a propeller are useful as replacements to terrestrial vehicles in difficult terrain. In the spring, when the sea or lakes are still frozen, but the ice has begun melting, it cannot be walked, skied, or driven on, and neither navigated by boat. Hydrocopters and aircraft are only ways to travel in such conditions. Furthermore, if the landscape is fractured by small and shallow lakes and bays, as in swamplands, it may be difficult to navigate even in good conditions. Observation and counting of protected species, e.g. Saimaa ringed seal, in such conditions has been conducted using a powered parachute. Another use that has been demonstrated is the herding of reindeer. Although the tundra is open terrain, there are no roads and the terrain is still uneven. 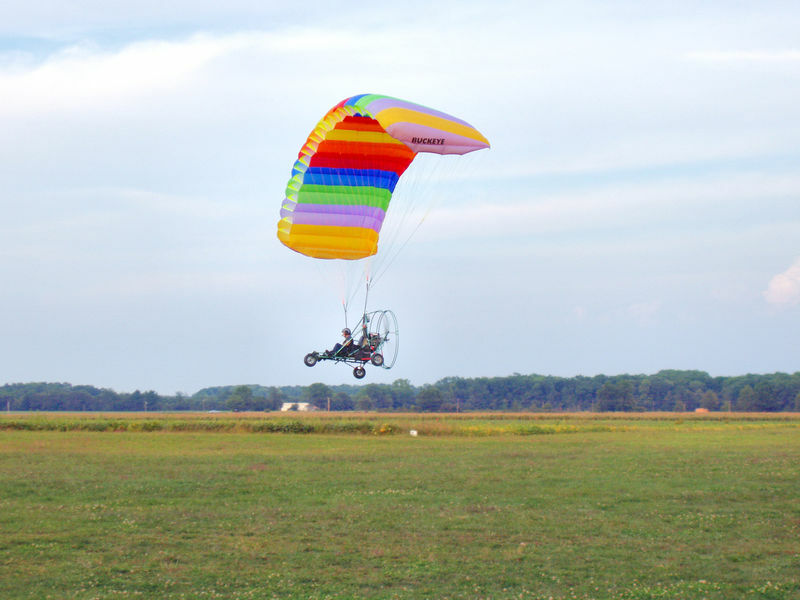 A powered parachute can be used instead of a snowmobile or a motorcycle. On October 1, 1964, Jalbert applied for patent for his new "Multi-Cell Wing" named "Parafoil" (also known as a "Ram-Air" wing), which was a new parachute design. His ideas finally were registered as U.S. patent 3,285,546 on November 15, 1966. However a first motorized version by Nicolaides had already flown in 1964. Finally in March 1981, the P–1 was created by Steve Snyder, Adrian Vandenberg and Daniel Thompson. The first flight lasted only 25–30 seconds mainly because the paraglider suffered from torque problems. It took 2 years to fix these problems, but in 1983 the ParaPlane corporation was organized under Snyder's leadership to produce the first commercial paragliders. In 2004 Don Shaw mounted a standard motor scooter engine on a frame, with a parafoil above and propeller connected to the engine. There are also radio-controlled models of powered parachutes.